Sir Paul McCartney played Dodger Stadium last night for the first time since Aug. 28, 1966, when the Beatles played their penultimate show. A few things have changed since that day 48 years ago—the priciest ticket in the house went from $6 to $250, the screaming girls are now screaming grandmothers, and the 27-minute set from the Fab Four was replaced by a three-hour journey through Macca’s life as a Beatle, a member of Wings, and a solo artist. 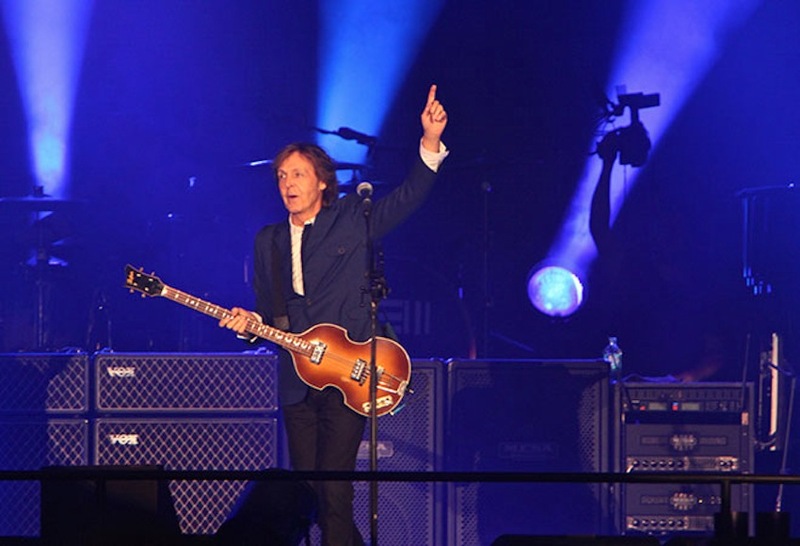 McCartney also performed a handful of songs off his latest album, New, but he knew his fans wanted more Beatles and seemed to delight in giving it to them. He delved into quirkier tracks like “Ob-La-Di, Ob-La-Da” and showcased famous B-sides like “Helter Skelter” and “I Saw Her Standing There.” Those hoping to hear less popular gems like “Yes It Is” or “Rain” could be the only ones mildly disappointed with the evening. Well, unless you were wishing for the rumored Ringo Starr appearance, which would’ve been a joy. Dave Grohl was also on the shortlist of McCartney’s musician friends who live in L.A., but there were no cameos (Kanye West stood next to us for a while, if that counts). After “Back in the USSR,” he told stories of how unbelievable it was to play Red Square in 2003, especially given the country’s longtime resistance to Western rock. While all the talk the former Soviet Union may have gone over the heads of the youngest crowd members, there were certainly plenty of them in attendance. Diverse multi-generational families filled the stadium, speaking to McCartney’s knack for cross-generational appeal. Hippies and hipsters find common ground in Macca, it seems. Shaking his hips, striking poses and taking no intermission, McCartney showed he remains downright jaunty at 72. His career shows no signs of slowing, and there’s no trace of his recent bout with a virus he picked up in Japan, which caused him to postpone a number of tour dates. “I get the impression you want to keep rocking,” he said with a sly smile during the second encore. Admit it, Paul—that’s what you want, too. Paul McCartney’s Out There tour features one more SoCal show at San Diego’s Petco Park on Sept. 28. Previous articleWho is Austin Beutner?